Gather around the Amish Table is one of the better recipes books I have read in a while. Most recipes have a short 2 to 3 paragraph story from the PlainCommunity “horse-and-buggy people” who contributed their recipes for this compilation. All recipes are plainly written and have easy-to-follow instructions for all cooks at any culinary level. There are ten sections that include everything from Breakfast to Snacks, Beverages and Extras to Meats and Main Dishes. I will share a few sections with you to show recipes that may spike your interest as did mine. The Breakfast and the Breads & Spreads sections you will find casseroles, granola, flavored oatmeal, pancakes and waffles, No-Knead Refrigerator Rolls, doughnuts, and drop biscuits. The Salads & Pickles section have Red Beet and Apple Salad, Ella’s Zucchini Relish, Bread and Butter Pickles. Snacks, Beverages & Extras share Kitchen-Made Apple Butter, Chocolate Syrup, Homemade Tea Concentrate, Four-Hour Root Beer, Homemade Baby Wipes, and Amazing Cleaner. 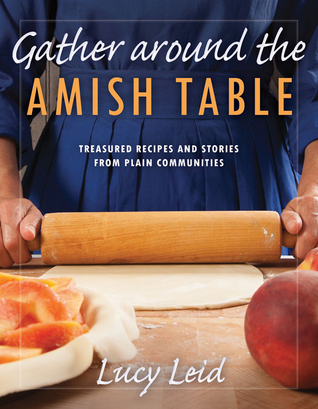 There is nothing that is not included in Gather around the Amish Table and with community stories added, it definitely completes this well-rounded recipe book. I highly recommend this recipe cookbook if you are seeking made-from-scratch, down-home recipes with flavor, pizazz, and natural ingredients. I received this book from the Litfuse Group in exchange for an honest opinion in accordance with the Federal Trade Commission Guidelines. This entry was posted in Book Review, recommended reading, Reviews and tagged amish, blogging, book reviews, breakfast, brunch, cookbooks, cooking, dinner, family recipes, foods, litfuse publicity, lunch, recipes. Bookmark the permalink.